Suitable for both novice and advanced marketers, PageWiz allows its users to launch high-conversion landing page campaigns within minutes. The wizard-style editor takes the hassle out of the equation by walking you through the process of launching a landing page, freeing professional marketers and small business owners from the oft-tedious and lengthy process of designing and developing an effective marketing campaign. Once the campaign is up and running, real-time statistics and A/B testing allow you to tweak your campaigns further for maximum conversion. While PageWiz enables novices to create, publish and optimize landing pages in no time, it caters to the more savvy and expert users as well. Start your own converting machine, and improve your website marketing, using a variety of templates and a drag and drop editor! Start your free-30 day-trial and upgrade your marketing system to the next level! PageWiz focuses on entrepreneurs, marketing agencies, and small businesses, inspired to build smart, stylish, and user-friendly landing pages to market to the masses. Begin your 30-day free trial before you commit to a paid plan and enjoy the best of templates on offer! Want to know if PageWiz is right for you? Free templates – PageWiz offers various highly convertible free templates with mobile adaptive-responsive version. You can easily edit and design templates, adaptable to your own needs. By using Blank template you can start afresh. This is ideal if you want to upload an existing design to Pagewiz. 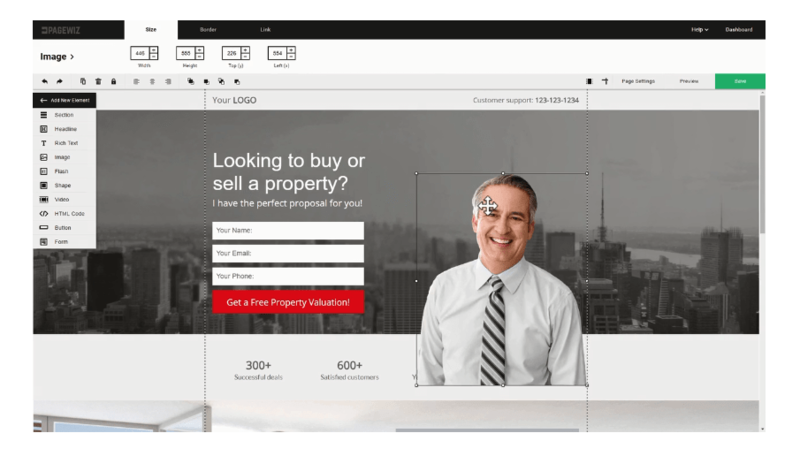 Use the drag and drop editor to create a personalized design for your marketing needs. The first step in building a landing page in PageWiz is selecting from a number of template options. Selection includes above-average number of templates, professionally designed for lead generation, click-throughs, or mobile apps. Customization – You can easily edit the designs to your taste, including swapping images and text. ThemeForest premium templates – choose and purchase a professional template from the ThemeForest community, especially designed for Pagewiz, importable and fully customizable for Pagewiz. Each template on offer is well conceived to provide high conversion rates for each landing page, along with all the SEO and marketing tools needed to get your site off the ground. Having all the tools available is an advantage. However, you also need to measure the success. Benefit from real-time statistics to help improve aspects of your landing page that may be under-performing. Build-in A/B testing automation: Create several versions of your landing page! Then assess which one is the most effective. Google Analytics & SEO Plugins: Easy implementation of all professional advertising tools and SEO plugins. Multiple email recipient: Pagewiz system captures several emails addresses to allow you to manage and share your campaigns with your customers and colleagues. Lead management: While Pagewiz system sends your leads to your email address, they are also stored in secured servers. Integrates with third party systems as salesforce, Mailchimp, AWeber, ConstantContact, GetResponse: Send leads directly to your CRM systems. PageWiz offers a headache-free step by step method to build landing pages. You simply select a template (or start from a blank page), add elements, choose a custom URL and publish. The builder is well conceived and designed, with available tools, such as Flash and HTML embeds, located conveniently on the left panel. Dragging onto the canvas and then clicking on an element brings up the item properties in an area directly above the workspace; convenient align buttons make it easy to look pro. The editor is comprehensive, you can customize any element on the page, yet very intuitive allowing you to create great landing pages without spending hours figuring our the interface. The new Form element has made the task of designing and managing forms easier than before. With this new feature, you can now add more than one form on the same landing page. Pagewiz’s support is tremendous The Knowledge Base overflows with useful guides related to the most frequent questions and problems. If you need email support, you may expect a response withing 24 hours; more often than not, your questions is answered within a few hours. Pagewiz is a valuable and cost-effective platform for beginners. You may sign-up for a 30-day free trial and attract up to 200 unique visitors to your page. The Basic plan is reasonably priced and offers numerous features, including 2 custom domains. PageWiz is a great platform for beginners, as well as advanced marketers and agencies. No need to be an expert marketer, amazing designer, or HTML coder. Create great landing pages, pre-built to convert. The free trial allows you to test the system and attract up to 200 visitors to your page. Overall, it’s one of the best landing page creators on the market. Lucas is a full-stack web developer. He serves as an essential part in the creation of various startups from the proof of concept to acquiring market leader positions.